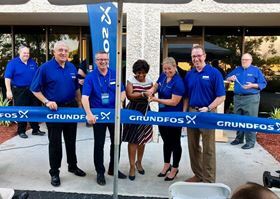 Deerfield Beach Chamber of Commerce executive director Denise Jordan joined Grundfos on 8 November for a ribbon cutting ceremony at the new Florida facility. Grundfos has expanded its US footprint with a new facility in Florida to serve the water and wastewater industries in the region. Located in Deerfield Beach, the new facility will be a distribution hub for Grundfos water and wastewater pumps, controls, and related accessories, and offer service and testing to the area. Grundfos employs more than 1200 people in the US at operations, sales and service facilities in Illinois (North American headquarters), Kansas, Pennsylvania, California, Texas, Indiana and Alabama. Grundfos appoints Ki Woong Ahn as country manager of Grundfos Singapore, with effect from 1 August 2018.